Homemade Birthday Chocolate Brownie Cake Recipe, an easy super moist from scratch layered chocolate brownie cake. Decorated with an easy whipped ganache frosting and Oreos. The best for birthdays and special occasions! 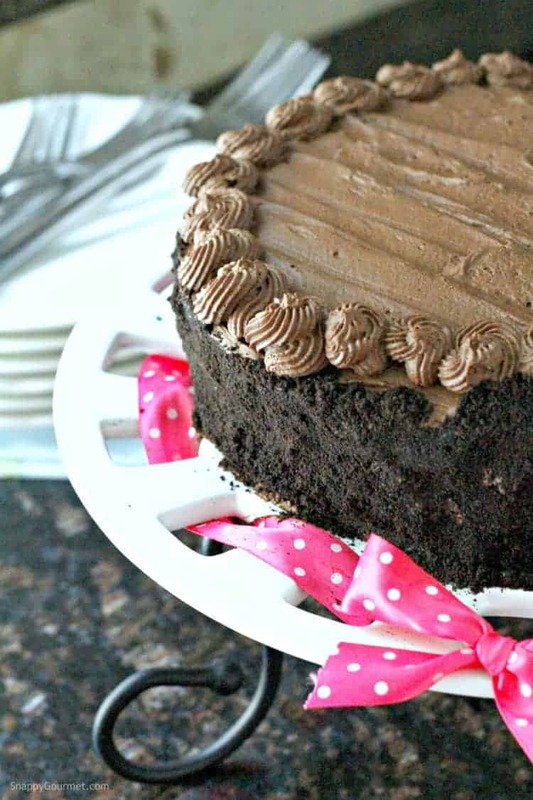 This Homemade Birthday Chocolate Brownie Cake recipe is truly INSANE! We’re talking insanely good and delicious! The best! It is one of the best chocolate cakes I’ve ever had! Rich, fudgey, and full of chocolate! It’s like what would happen if a rich chocolate cake and a fudge brownie had a baby. If you’re not a chocolate lover (do they really exist?) you might want to look away. Oh you know I like my brownies, like my Best Turtle Brownies, Chunky Peanut Butter Stuffed Brownies, and Mint Brownies. And even my gluten free Almond Flour Brownies. So it shouldn’t be too shocking that I combined some of my favorite brownies and cake into one! I made this brownie cake for my daughter’s birthday last week. She wanted lots of chocolate so she was quite the happy child! This is an easy recipe but maybe not one of my more “snappy” recipes. 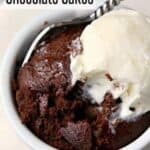 This Homemade Birthday Chocolate Brownie Cake is definitely a great recipe and cake for birthdays, holidays (Christmas or Valentine’s Day would be great! ), or any special occasion. 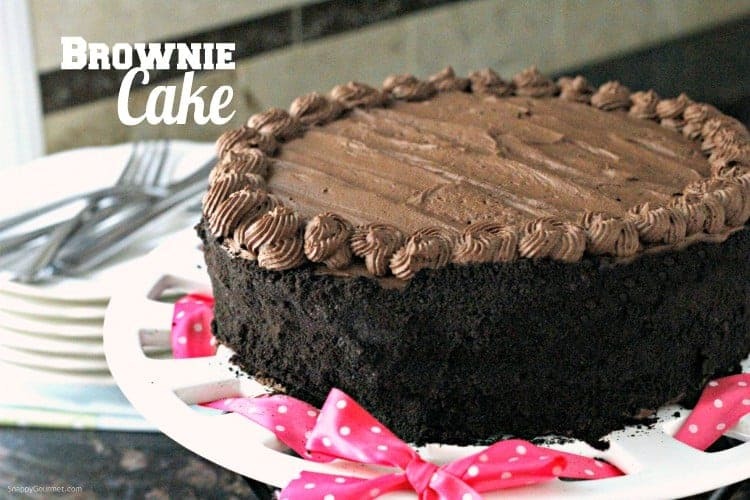 If it was up to me though, I’d say this brownie cake is perfect any day! I really did not think this cake would turn out. I mean I really did not think it would. I’m not generally one for making homemade from scratch cakes but after this, I may be making a few more in the near future. I’ve had some cake disasters. BIG DISASTERS. But if you’re wondering how to make a brownie cake, I think this recipe will do it! 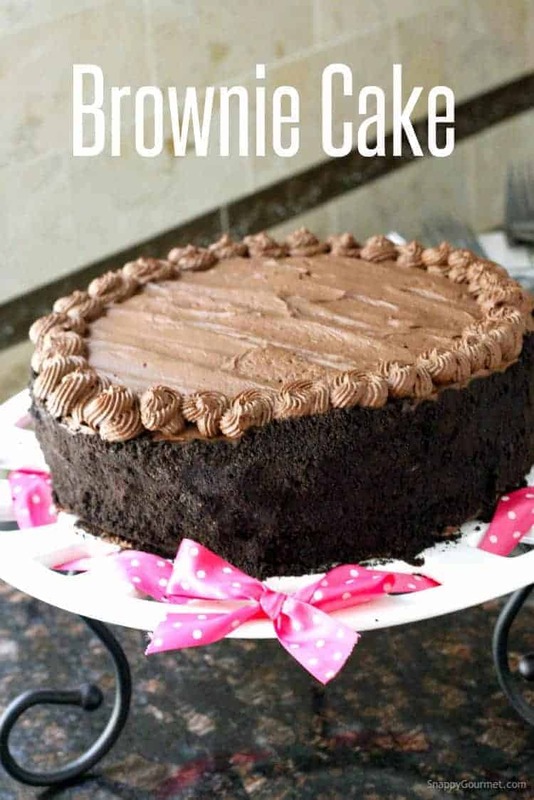 I casually looked at a bunch of chocolate cake recipes and chocolate frosting recipes then just kind of made this one up as I was going along combining my favorite parts of a lot of different chocolate cake and brownie recipes. I had every intention of going to the store that night and buying a cake so I didn’t even bother taking any photos. Why did I even bother trying to make a homemade chocolate cake you are probably asking, yes? Well, when my daughter looked up at me and told me she wanted a HOMEMADE cake how could I possibly say no??? Trust me, I was cursing in my mind. Like I said, I was so confident this brownie cake was NOT going to work out that I didn’t even bother taking any photos while doing all the prep work. But trust me, it wasn’t too difficult to make. To start this brownie cake, be sure to preheat your oven first. Next, grease two 9-inch round cake pans, then line the pans with parchment paper, and grease those. Depending on your pans you can use a nonstick spray and/or butter and flour (with a little cocoa powder) to prevent sticking. Melt the butter in a small saucepan then slowly add the water, cocoa powder, and coffee and stir or whisk until smooth. You won’t really taste the coffee, so don’t worry if you’re not a coffee person. It just intensifies the chocolate a little bit. If you don’t want to add the coffee, don’t worry, you can leave it out. I used unsweetened dark cocoa powder, but you can use regular unsweetened cocoa powder. Take the cocoa and butter mixture off the heat, and set it aside to cool. Meanwhile, mix together the flour, sugar, baking soda, and salt in a large bowl. Then mix in the Greek yogurt, buttermilk, eggs, and vanilla. When your chocolate mixture is fully cooled, add it to the bowl and mix until just combined. Pour the batter into the prepared 9-inch round baking pans. Spread with an offset spatula or back of a spoon so that the batter is in an even layer in both pans. Bake the cakes for about 30-40 minutes or until a toothpick inserted into the middle of each cake comes out clean. Remove the cakes from the oven, cool slightly then remove the cakes from the pans and place on wire cooling racks to cool completely. 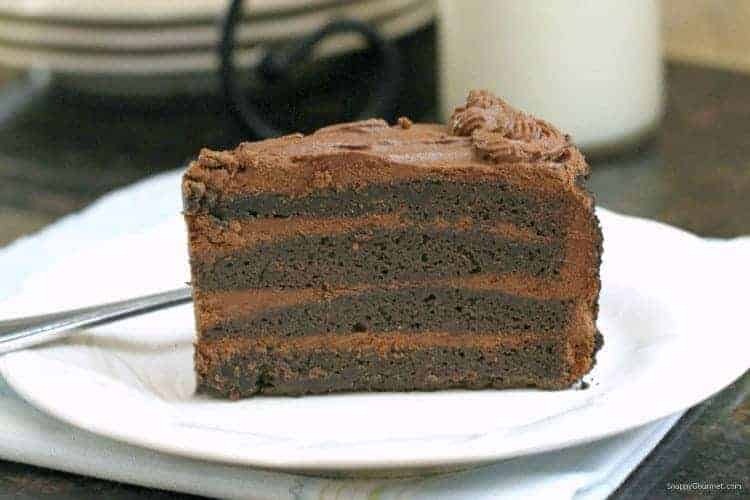 When the cake layers are completely cool, use a long serrated knife to cut each layer in half horizontally. 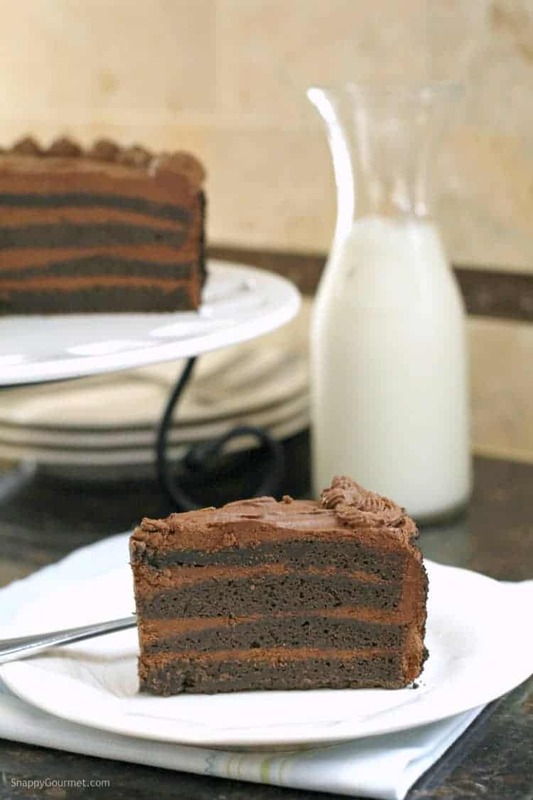 If you’ve never cut a cake layer in half, place a long serrated knife about halfway down the cake layer and slowly cut into the cake just a little at a time as you turn the plate with the cake layer on top. Be sure to keep your knife in the middle of the layer. Don’t move the knife, just turn the cake. You don’t HAVE to cut the layer in half. If you decide to make this a two layer cake, you may just want to cut back on the whipped chocolate ganache frosting. The Whipped Chocolate Ganache frosting only has a few ingredients and is also one of the best chocolate frostings I’ve ever had! It’s really a whipped ganache and mostly just cream and chocolate. Place the chocolate in a large bowl. Meanwhile, heat the cream in the microwave or small saucepan. Pour the cream over the chocolate and let it sit for about 5 minutes. Stir in the vanilla and salt until the chocolate is smooth. Set aside to cool or place the bowl over an ice bath and stir until ganache is cold. With an electric mixer on medium speed, beat the ganache until thick and frosting consistency. But be WARNED, do not over whip the frosting or it will turn into chocolate BUTTER! I had a couple of bags of dark chocolate chips so I just used those but of course the better chocolate you use, the better this frosting will be. Everyone uses a different ratio of chocolate to cream, but this one seemed to work well for me. The frosting will harden when you put it in the fridge so don’t worry if it seems a little runny. Just make sure it is just thick enough to hold and spread over the cake. This makes A LOT of whipped ganache chocolate frosting. Plenty to use to decorate if you so choose. I put a little frosting in a pastry bag and just did a very quick design around the edge. Totally not necessary though. If you don’t like a lot of frosting, just cut the recipe in half. My daughter wanted Oreos on her cake so to appease her I put some Oreo cookie crumbs on the outside of the cake. I had to lean the cake over slightly to get them on there. The things I’m willing to do in the name of CHOCOLATE! I would not suggest serving this cake if it’s HOT outside, but otherwise, this cake seemed to hold up really well in the fridge. I liked it right out of the fridge cold but others seemed to like it more room temperature so your choice! Let me know if you make this cake and what you think! Hope you enjoy this Homemade Birthday Chocolate Brownie Cake Recipe! 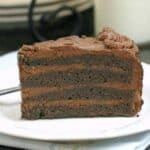 Homemade Birthday Chocolate Brownie Cake Recipe, an easy super moist from scratch layered chocolate brownie cake perfect for birthdays and special occasions! Preheat oven to 350 degrees F. Grease two 9-inch round cake pans (or spray pans with nonstick baking spray), then line bottoms of pans with parchment paper. Grease (or spray with nonstick baking spray) bottom of pan (dust with flour and cocoa powder if desired). Place butter in a small saucepan over medium-high heat, stir occasionally until melted. Slowly add water, cocoa powder, and coffee into pan and stir constantly until smooth and not grainy, about 3-5 minutes. Remove from heat and cool. 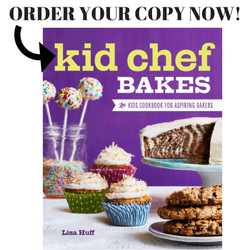 Mix together flour, sugar, baking soda, and 1/4 teaspoon salt in large mixing bowl until well combined. 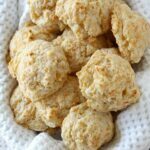 Mix in yogurt, buttermilk, eggs, and 1 teaspoon vanilla until just combined. Mix in cooled chocolate mixture until just combined. Pour batter evenly between two pans. Bake cakes for about 30-40 minutes or until a wooden toothpick inserted into middle of cake comes out clean. Cool slightly then remove from pans. Cool completely, then cut each cake layer in half horizontally with long serrated knife. Place chocolate in large mixing bowl. Heat cream in large microwave-safe container in 30 second intervals until hot, about 1-2 minutes. Pour hot cream over chocolate and let stand about 5 minutes. Stir in 1 teaspoon vanilla and 1/8 teaspoon salt, and stir mixture until smooth. Place bowl over ice bath and stir ganache until cold. With an electric mixer on medium speed beat the ganache until just thick enough to spread over cake being careful to not overwhip. Place one layer of cake on serving platter, top with frosting and spread to form thin layer. Repeat with cake layers and frosting. Frost and decorate top and sides of cake as desired. Garnish sides of cake with Oreo cookie crumbs or as desired. 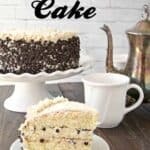 Store cake in refrigerator until ready to serve. SNAPPY TIPS: Be very careful to not over mix the frosting or you'll end up with chocolate butter rather than a spreadable frosting. The frosting will harden a bit in the fridge. SNAPPY SUBSTITUTIONS: I used dark chocolate cocoa powder for the cake and dark chocolate chips for the frosting. 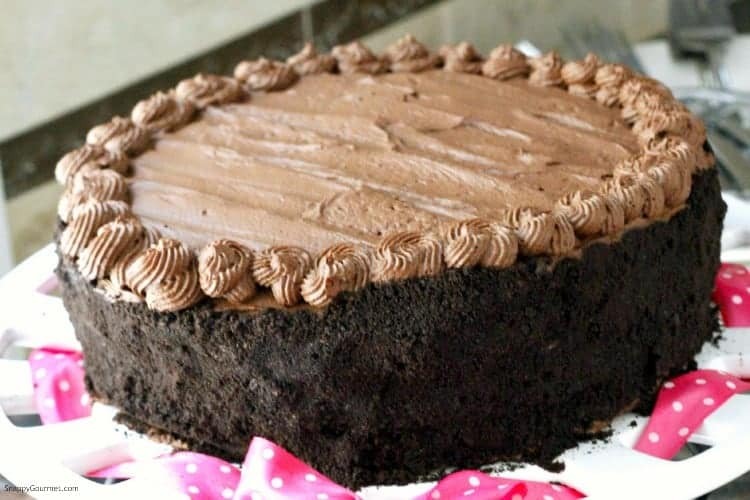 You can substitute different kinds of chocolate but the cake may be a lot sweeter depending on what you use. I had the same trouble with the cake kind of deflating as it cooled. Was only able to do 3 layers because of it. Any tips? 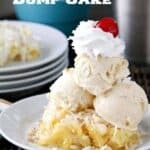 Is it possible to double the cake recipe? 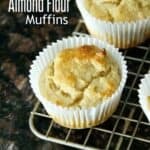 I’m new to baking so any tips would be great! Hmmm, the cake is more of a brownie so possible it would deflate slightly. The mix might have been over mixed and too much air causing them to deflate. You can try adding eggs one at a time and beat between each addition. Then don’t beat the mixture too much or at too high of speed when you add the flour. Hope that helps! You don’t have to split the cake layers in half either if you have trouble. I just made this cake for my husband’s birthday. The flavor was excellent but the texture seemed wrong. I am an experienced cook and baker. I followed the recipe as printed. I do not buy instant coffee, so I did use 8oz of strong fresh brewed coffee instead of the 1t of instant + 1 c of water. Also a warning to anyone who buys a small carton of yogurt; they use to be 8oz, then 6oz; now most are only 5.3 oz. Unfortunately I think that is net weight oz, because when I measured it out, it was only about 1/2c or 4oz liquid measure of yogurt in the cup. So I had to add from another to make up the difference. I used properly prepared 9″ round pans, and my oven temp is good. After 33 min, the cakes had risen nicely. They smelled done, had clean toothpick tests, and were pulling away from the edges, so looked done. But after cooling in their pans for about 20 min, the cakes had collapsed entirely. After I removed them, they were only about 1 inch tall each. I couldn’t slice them in half horizontally if I wanted to. I made a half order of the whipped ganache, which was plenty, and I added a little preserved cherries to the filling. The flavor was delicious, but the texture is almost like a flourless torte, very dense, not like a cake or a brownie at all. Is this what the cake is suppose to be like, or did something fail? Should it have cooked longer? For the ganache, I used the provided proportions. 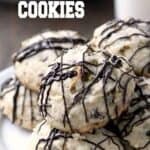 I used high quality gourmet choc chips; 1/2 semisweet and 1/2 bittersweet to get my preferred level of sweetness. And I added an overful Tablespoon of coffee liquor for extra depth. I was intrigued by the warning to avoid making chocolate butter by mistake: some day I want to try making that on purpose. The ganache whipped up nicely, and 1/2 a batch was more than enough for my cake. Adding some preserved cherries (not cherry preserves) to the filling made a great contrast in flavors too. I just want to know why the cake layers sunk to only 1 inch tall. Is that normal? HI! So sorry you had so many problems with the cake. It’s been a while since I made it but the texture is definitely not like a normal cake. An inch sounds a bit small. Sorry again!